This sauted scallops with a foie gras sauce literally takes less than 20 minutes to make this and is SO good. Oh well, you can still serve the scallops and foie-gras sauce with anything else you’d like. Still super simple to do, a surprising combo yet a very tasty one. So I know that Foie Gras is one of those foods with much debate. I’m aware it’s been banned in some places (including California) and I don’t want to debate the ethics of it here but it’s a VERY popular holiday dish in France and is readily available. It used to be very expensive but you can now find it at any price in even the smallest of French supermarket. For this recipe, you don’t need top quality Foie Gras since it’s going to end up melted anyways. In a small sauce pan under very low heat, put the heavy cream and bring it to temperature. Cut up the Foie Gras in small pieces and put it inside the cream, gently stir until it has fully melted. Add the wine and continue cooking on gentle heat. Do not let it boil or the sauce will separate. If you want to add a little flavour kick, add a small pinch of piment d’Espelette (or a bit of smoky paprika if you don’t have piment d’Espelette). Make sure the scallops are nice and dry by letting them rest on kitchen paper – especially if they were frozen (otherwise, they will be water logged and will not cook as nicely). Just before you are ready to cook the scallops (and everyone is seated at the table), put a large pan on high flame and let the pan become nice and hot. When you are ready to cook, drop a bit of butter in the pan and quickly swirl it around (do not let the butter burn – light brown is OK, dark brown is too much). Add all the scallops to your pan making sure that there’s a little space in between each of them. While they are in the pan, add a bit of ground pepper and salt to the scallops. After one minute, start turning the scallops around. They should be nicely golden on one side. Leave for another 30 to 45 seconds and turn off the heat. Start placing the scallops on your plate and then drizzle some of the warm Foie Gras sauce on top, serve right away. 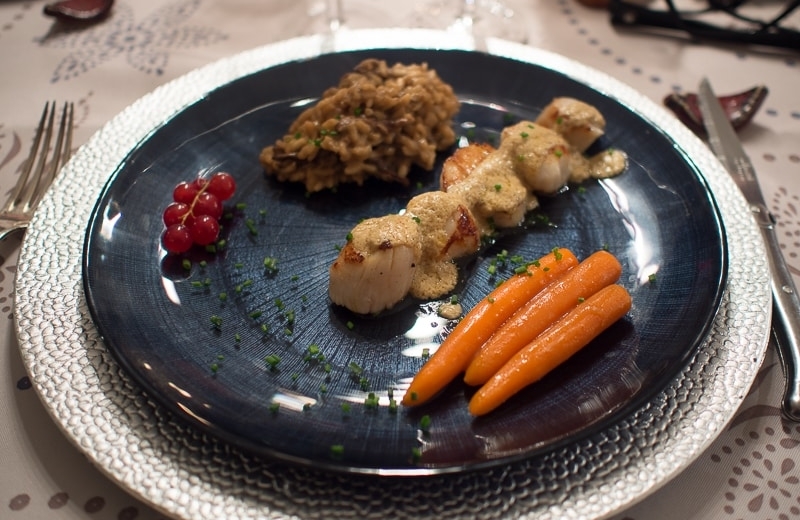 As you can see on the picture, I chose to serve the scallops with a Porcini Risotto and some glazed carrots, but fresh pasta or rice will do fine as well (make sure you plan a bit more sauce then). Bon appétit and make sure to let me know in the comments if you made that dish and how it turned out for you!